We now know William Harvey as one of the great heroes of science, starting a revolution in the medical anatomy field as great as Darwin’s theory of evolution and Newton’s theory of gravity. Yet, when Harvey rocked the medical establishment with his hands-on observation of the body’s blood circulation system, he needed to be almost apologetic for demolishing the long-established, but woefully inadequate, understanding handed down for centuries. The book begins with an obsequious dedication to King Charles I, followed by a diffident preface addressed to Doctor Argent. It is given in full below, as given in the 1889 translation of Robert Willis as revised and edited by Alex. Bowie. The text speaks for itself on the work to which Harvey had dedicated himself for almost a decade. He writes very modestly to make his innovations more palatable to any readers still steeped in the old ways. “To his very dear Friend, Doctor Argent, the excellent and accomplished President of the Royal College of Physicians, and to other learned Physicians, his most esteemed Colleagues. I have already and repeatedly presented you, my learned friends, with my new views of the motion and function of the heart, in my anatomical lectures; but having now for more than nine years confirmed these views by multiplied demonstrations in your presence, illustrated them by arguments, and freed them from the objections of the most learned and skilful anatomists, I at length yield to the requests, I might say entreaties, of many, and here present them for general consideration in this treatise. Were not the work indeed presented through you, my learned friends, I should scarce hope that it could come out scatheless and complete; for you have in general been the faithful witnesses of almost all the instances from which I have either collected the truth or confuted error. You have seen my dissections, and at my demonstrations of all that I maintain to be objects of sense, you have been accustomed to stand by and bear me out with your testimony. And as this book alone declares the blood to course and revolve by a new route, very different from the ancient and beaten pathway trodden for so many ages, and illustrated by such a host of learned and distinguished men, I was greatly afraid lest I might be charged with presumption did I lay my work before the public at home, or send it beyond seas for impression, unless I had first proposed its subject to you, had confirmed its conclusions by ocular demonstrations in your presence, had replied to your doubts and objections, and secured the assent and support of our distinguished President. For I was most intimately persuaded, that if I could make good my proposition before you and our College, illustrious by its numerous body of learned individuals, I had less to fear from others. I even ventured to hope that I should have the comfort of finding all that you had granted me in your sheer love of truth, conceded by others who were philosophers like yourselves. True philosophers, who are only eager for truth and knowledge, never regard themselves as already so thoroughly informed, but that they welcome further information from whomsoever and from wheresoever it may come; nor are they so narrow-minded as to imagine any of the arts or sciences transmitted to us by the ancients, in such a state of forwardness or completeness, that nothing is left for the ingenuity and industry of others. On the contrary, very many maintain that all we know is still infinitely less than all that still remains unknown; nor do philosophers pin their faith to others' precepts in such wise that they lose their liberty, and cease to give credence to the conclusions of their proper senses. Neither do they swear such fealty to their mistress Antiquity, that they openly, and in sight of all, deny and desert their friend Truth. But even as they see that the credulous and vain are disposed at the first blush to accept and to believe everything that is proposed to them, so do they observe that the dull and unintellectual are indisposed to see what lies before their eyes, and even deny the light of the noonday sun. They teach us in our course of philosophy to sedulously avoid the fables of the poets and the fancies of the vulgar, as the false conclusions of the sceptics. And then the studious, and good, and true, never suffer their minds to be warped by the passions of hatred and envy, which unfit men duly to weigh the arguments that are advanced in behalf of truth, or to appreciate the proposition that is even fairly demonstrated. Neither do they think it unworthy of them to change their opinion if truth and undoubted demonstration require them to do so. They do not esteem it discreditable to desert error, though sanctioned by the highest antiquity, for they know full well that to err, to be deceived, is human; that many things are discovered by accident, and that many may be learned indifferently from any quarter, by an old man from a youth, by a person of understanding from one of inferior capacity. My dear colleagues, I had no purpose to swell this treatise into a large volume by quoting the names and writings of anatomists, or to make a parade of the strength of my memory, the extent of my reading, and the amount of my pains; because I profess both to learn and to teach anatomy, not from books but from dissections; not from the positions of philosophers but from the fabric of nature; and then because I do not think it right or proper to strive to take from the ancients any honour that is their due, nor yet to dispute with the moderns, and enter into controversy with those who have excelled in anatomy and been my teachers. I would not charge with wilful falsehood anyone who was sincerely anxious for truth, nor lay it to anyone's door as a crime that he had fallen into error. I avow myself the partisan of truth alone; and I can indeed say that I have used all my endeavours, bestowed all my pains on an attempt to produce something that should be agreeable to the good, profitable to the learned, and useful to letters. 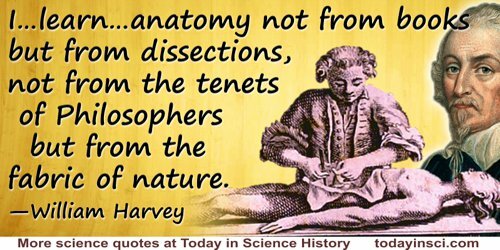 Science Quotes by William Harvey.